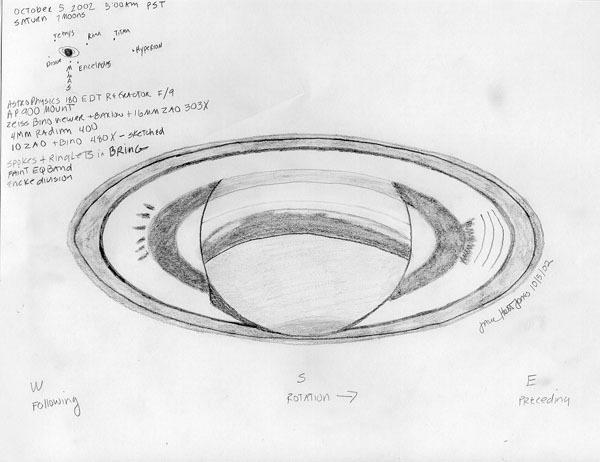 Saturn sketched by Jane Houston Jones, October 5, 2002. The planet globe casts a shadow on the rings. The A-ring shows the Encke division, B-ring appears white, and the A-ring a light gray. The C-ring is dark grey, with the globe showing through the crepe ring. As December opens, Mars is still high in the sky in the early evening. It's receding from us as we race away from it in our tighter orbit,and by now has shrunk to 11 arc seconds (down to 9 by month's end),less than half its apparent size at opposition a few months ago. But it's still worth looking at! For one thing, it's not that much smaller than it gets at less favorable oppositions; there are still details there to be seen. For another, it's interesting to see how gibbous it looks now; it's very easy to see the shadow on one side now that Mars is no longer "full." Jupiter rises a little before midnight; now's the time to get a start on this winter's Jupiter season. Early reports suggest the great red spot has continued its darkening trend - it may be becoming much more visible than it has been in recent years. In early December evening twilight, Mercury and Venus share the southwestern sky. Venus doesn't set for a couple of hours after sunset, though it remains relatively low in the sky for those two hours. Its phase is still slightly gibbous. Mercury is visible low in the twilight for the first two-thirds of the month, changing in appearance day by day from a small third quarter disc of 5.7 arc seconds to a slim crescent of 9 arc seconds, until it finally becomes too dim to see, and too close to the sun, for the last third of the month. If you have a good western horizon, this is a good time to keep an eye on Mercury - you aren't likely to see any surface details, but the varying phase and size of the innermost planet are one of the most rapidly changing features in our solar system, and it's fun to compare the differences from night to night. The outer planets, Uranus, Neptune, and Pluto, are all rather close to the sun this month, and won't be easily observable. Saturn, though, is the showpiece of this December's sky. It rises in early evening and is visible all night. With the rings wide open, any telescope will show a beautiful view, with the Cassini division easy to see. On better nights you should be able to spot more ring details, some bands of different colors on the planet, and sometimes even transient features like storms. Saturn reaches opposition on December 31st. Let's talk a bit about Saturn's ring system. You probably already know that the rings aren't one big flat sheet: they're actually composed of many, many small particles, all orbiting Saturn in roughly the same plane. The gaps in the ring are usually caused by the gravitational perturbation of one or more of Saturn's moons. For example, a particle orbiting Saturn at a distance which gives it a period half that of one of the moons will find that on every other orbit, it gets an extra pull from the moon - and eventually, that extra tug will pull the particle into a different orbit, a little farther from Saturn than it was before. So over a long period of time, moons create zones in the rings which are relatively free of particles: and so we see gaps in Saturn's ring system. When people talk about Saturn's rings, they usually divide them into three areas: a relatively thin outer ring, the "A" ring; a thicker inner section, the "B" ring; and a wide, but translucent, inner ring called the "C" ring, sometimes called the "Crepe" ring. The Crepe ring is much less bright than the other two; some nights it will be very hard to see even with a large telescope, while on other nights, it's obvious even with a 60mm. Ambient sky brightness and transparency probably have a lot to do with Crepe ring visibility. The A ring has some gaps inside it; in particular, about 1/4 of the way from the outside of the ring is a subtle gap which has quite a bit of controversy surrounding its name, since it was "discovered" over and over again by various observers over the years; some people call it the Encke division, while others claim that the Encke division is a very thin feature which is almost never visible from amateur telescopes, and that the feature we see is one which was discovered by Keeler, or Kater, or diVico, or perhaps someone else. So no one knows quite what to call it; but nevertheless, there it is, a darkening in the outer part of the A ring, and it's been much easier to see in the last few years with the rings open as wide as they are. So take a look, and don't worry too much about what to call it! The B ring, as well, has some features visible in an amateur telescope. It's common to see shading in the B ring: for example, it may shade from brighter at the outside edge to dimmer on the inside where it meets the Crepe ring. On nights of really excellent seeing, you may see more than that: there are thin, subtle gaps inside the B ring itself, as well as radial spokes which are sometimes visible to an eagle eyed and practiced observer under perfect conditions. But what about that big, wide gap between the A and B rings - the one that you can see in even the smallest telescope on nearly any evening? That's the Cassini Division, the most prominent feature in Saturn's ring system - and Jane Houston Jones, longtime Ephemeris co-editor and the observer who drew this month's Saturn sketch, will be working there soon. We've all benefitted from Jane's and Mojo's influence on SJAA's ring system, and we'll all miss them as their orbits dip southward to Pasadena, but I'm sure their perturbations on JPL's system will be equally observable. I know I'll be watching. Thanks, Jane and Mojo, and good luck!